I’ve been neglecting you all. I’ve received a couple of awards lately and not shared them. I apologize ladies. I do appreciate that you have taken the time to tell me you find something valuable in my blog. 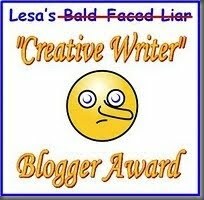 Next is the Creative Blogger (or bold-faced liar) award. Margaret at Musings of a Would-Be Writer graced my blog with this award. Thank you, Margaret! 2: Copy the logo and put it on your blog. 3: Link to the giver. 4: Tell six outrageous lies and one truth about yourself. 5: Give to 7 others who might have fun with it. 7: Comment on the recipients’ blogs to let them know about it. OK, 7 things about me. 1- I’m the next Phil Mickelsen. 2- I’ve lived the same place my whole life. 3- I am ridiculously cool. 4- I have a secret longing to open a bed and breakfast near a golf course. 5- I’ve competed in rodeo my whole life. 6- I’m secretly a world-famous author who is trying to write with a modicum of anonymity. 7- I’ll be a presenter at the Oscars in 2 weeks. I can’t pick 7 people to pass this on to so I’m not going to pick any. If you want to participate, consider yourself tagged. Oh, and can you guess which is the truth in my list? Congrats on winning the awards….as for the truth, all I can say is that u've kept me guessing. Congrats on the awards! My constantly pile up it seems!! Umm I am going to say that your one truth is that you have secretly wanted to open a bed and breakfast near a golf course! At least that is the one that caught my eye immediately 🙂 Intersted to see the real truth! These are harder to pick than you'd think. I'm going to have to go with #6 🙂 And there's an award for you over at my place. Thanks, everyone! Wow, you all have such widely varying opinions of what is true about me. I'll reveal the answers tomorrow sometime. Well, duh, #3 is true! Not that I don't think you're probably ridiculously cool, but I'm guessing #2.